So you want one too ? 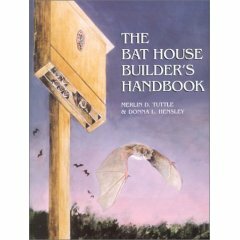 Purchase Bat Conservation International's , Bat House Builder's Handbook! from Amazon.com. I bought a copy and built a new bat house using the latest information. BCI claims a very high success rate when their techniques are followed. I'm no longer selling my own plans because BCI's book is really just the better option. Give it a try. It Works! I finally got bats in my bat house using the suggestions and plans from the Bat House Builder's Handbook! Need a Bird House or a Toad House ? It seems that many people who end up here also want to get a good book on building Bird Houses or maybe Toad Houses. The Beastly Abode has plans for birds, toads, butterflies, bats and other wildlife. I don't know how good the bat house plans are, but the book certainly looks interesting ! I won't even go into how successful my bird house is. It currently has a squirrel living in it... Hmmm... I once had a bird try to build a nest in my Bat House. Maybe I should build a Toad House and it would attract Bats !